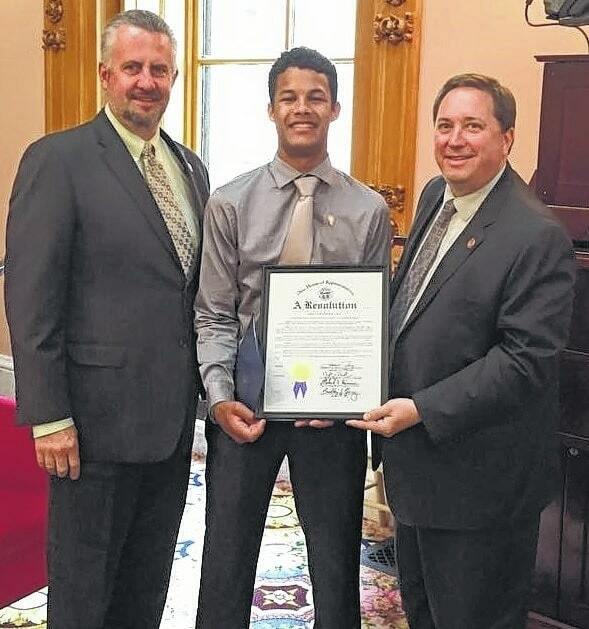 Ethan Conley on the floor of the Ohio House with Representatives Mike Henne (left) and Jeff Rezabek in recognition of being selected as the 2015 Children’s Miracle Champion for Ohio. COLUMBUS — Ethan Conley was recognized on the floor of the Ohio House by Representatives Jeff Rezabek and Mike Henne for being selected as the 2015 Children’s Miracle Champion for Ohio. Representative Rezabek shared Ethan’s story and presented him a resolution from the Ohio House, recognizing his honor. Ethan spoke about his faith and asked for the continued support of children’s hospitals. His speech was met with a standing ovation from the chamber. Then he was recognized in the Ohio Senate Chamber by Senators Bill Beagle and Peggy Lehner. Dayton Children’s President and CEO Debbie Feldman and Dayton Children’s Board of Trustees Vice Chairman Mike Shane were on hand to witness the recognition. Ethan and his family just returned from a trip to Washington, DC, where he met with U.S. senators and representatives as the 2015 Children’s Miracle Champion for Ohio. He along with the champions from other states shared how they owe their lives to children’s hospitals. Ethan survived an extremely rare virus. It was the only time doctors and nurses at Dayton Children’s have seen this virus, and to this day, it’s the worst case documented anywhere in the world. “Ethan is a miracle child and survived what no person in the world has ever survived,” says mom, Rebecca. In 2010, Ethan was diagnosed with viral myositis with rhabdomyolysis after his parents brought him screaming in pain to the Soin Pediatric Trauma and Emergency Center at Dayton Children’s. His legs were swollen to twice their normal size and he was in agony. The damage the virus was doing to his muscles was flooding his bloodstream with the enzyme CPK, which was overloading his kidneys. His organs began to shut down. Ethan’s chances hovered at around 20 percent. He was placed on advanced life support: a respirator to breathe, dialysis for his failing kidneys and medication to stabilize his blood pressure and heart rate. This won’t be the first time Ethan’s story thrust him into the national spotlight. His story was featured on an episode of Animal Planet’s “Monsters Inside Me” in 2012. The show depicts what happens when human beings fall prey to parasites.